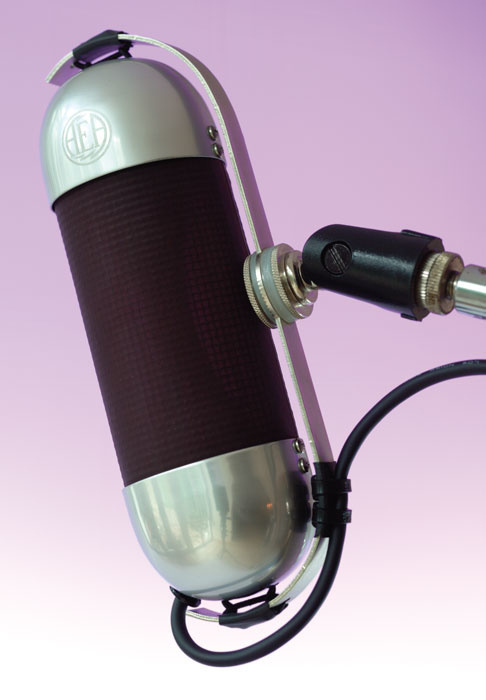 This classy ribbon mic doesn't just look great - AEA's thoughtful design means that it also offers great sonic results. There is a noticeable resurgence of interest in ribbon microphones at the moment, roughly 50 years since they were ousted in popularity by studio capacitor mics. Alongside the well-established classics from the likes of Coles, Royer and AEA, there are now numerous new low-cost offerings from a variety of sources, notably (but not exclusively) in China. Ribbon microphones have a smoothness at the top end rarely seen in capacitor microphones, which seems to lend a very natural, easy-on-the-ear quality to harmonically complex sources. The down side of most ribbon mics is that they tend to be heavy, are far more delicate than capacitor or moving-coil mics, require high-gain, low-noise preamps, and usually have a fearsome proximity effect (thanks to the full pressure-gradient operating mode). All of this makes placement a little more involving — and interesting — than most mics. A relatively recent addition to the ribbon mic armoury is the R92 from the Californian company Audio Engineering Associates (AEA). I've reviewed several impressive ribbon mics from AEA in these pages before: the classic reissue R44CX, the stereo R88 and the award-winning R84 — from which the R92, reviewed here, is effectively derived. The new R92 employs AEA's Large Ribbon Geometry design, like the R84, but this new model has been optimised specifically for close-miking applications. Most vintage ribbon microphones are spectrally balanced for medium and distant placements, principally because their inherently large proximity effect precludes close miking. However, the R92 has been engineered to exhibit a flat response when placed about six inches from the source, and that allows it to be used for a range of close-miking applications, including vocals, electric and acoustic guitars, drums, percussion and, of course, brass and strings. The R92 has a classic, yet contemporary look to it. A C-shaped aluminium bracket supports a lozenge-shaped mic capsule, with polished metal end caps supporting a ribbed black windscreen. This bracket is sensibly positioned to lie in a side null of the figure-of-eight polar pattern and, unusually, the stand mount connects to the middle of the 'C' with a 5/8-inch threaded socket (a European 3/8-inch adapter wasn't supplied with the review model). The output is via a captive two metre cable terminated in an XLR. The mic capsule is suspended from the bracket on short rubber O-rings, providing a worthwhile level of shockmounting — pressure-gradient mics are particularly prone to mechanical vibration. The capsule itself is about seven inches long and 2.5 inches in diameter, but the overall dimensions, including the mounting bracket, are closer to eight by three inches. The surprising thing, though, is that despite the size of this mic it isn't very heavy at all, due to the benefits of modern, high-efficiency magnetic materials. It weighs less than 2lbs even when packed away in its protective case! The actual ribbon transducer is 59.7mm long, 4.7mm wide and 1.8 microns thick, and is fairly well protected behind a multi-layer gauze and wire-mesh screen. The front side of the mic is indicated by an etched AEA logo on the mic's silver top cap. That indication is important for several reasons. Firstly, like most ribbon mics, the R92 has a bipolar pickup pattern, the front of which is designated the positive polarity side. This is significant in multi-miking applications. The other reason is that the front and rear pickup lobes of this microphone have been deliberately engineered to provide different sound characters — something I shall return to later. The microphone's technical specifications are much as expected. The frequency response is given as extending between 20Hz and 18kHz (±3dB) when placed approximately six inches from the source. The R92, despite its impressively efficient magnets, still has a relatively low output, at 1.75mV/Pa (55dBV/Pa), which means that it needs to be partnered with a preamp able to provide a lot of gain with minimal noise. Many budget preamps run out of puff at 40dB of gain, but that's only the starting point for this mic when in front of a quiet vocalist. As a passive dynamic microphone, the R92 is a little sensitive to its loading impedance. AEA recommend a minimum of 1.5kΩ, which won't trouble most preamps, but the higher the better — and in this regard I found the variable input impedance of my Focusrite ISA428 preamp very handy. The mic can handle peaks of up to 135dB SPL but the specifications suggest one per cent distortion is reached at a more modest 115dB SPL. Like all ribbons, the R92 contains very strong magnets and these will attract any magnetic particles that happen to be around — the so-called 'tramp iron.' These 'foreign bodies' can stop the mic working properly, so it pays to keep ribbon mics covered or packed away when not in use. Also, because ribbon transducers are relatively large and only lightly tensioned (to maximise the transient response), they can sag under their own weight if left horizontal for long periods — so ribbon mics should always be stored with the ribbon vertical. Another critical precaution to take with ribbons is to protect the mic from wind blasts. The R92 has a pretty effective pop screen built in but, even so, it probably wouldn't survive more than a single drum beat inside a kick drum. So always avoid placing the mic in front of any source that generates air currents that you can feel on your hand — or protect it with a decent wind screen. A particularly powerful guitar chord delivered from a closely miked high-powered cab has been known to take out ribbon mics, so be careful! Another perennial concern with ribbons is the issue of phantom power. As a balanced source with a floating (non-earthed) output, the R92 — like most modern ribbons — can tolerate phantom power quite happily. However, should there be a cable or supply fault such that the 48V phantom gets applied directly across the ribbon, the output will go very low level and tinny (because the current will turn the ribbon into a motor instead of a generator), and it might even go phut! So, where possible, it would be a wise precaution to avoid having phantom power on the cable at all. AEA hasn't followed the 'active ribbon' route chosen by, for example, Royer and some of the Chinese manufacturers. While incorporating active phantompowered electronics in the ribbon mic eases the requirements of the preamp, it also adds cost, distortion and noise, and potentially reduces the dynamic range and flexibility. Wes Dooley, designer of the AES ribbon mics, feels it is better to stick with completely passive, but well engineered ribbons... and to make and sell his own ribbon mic preamp (see box)! After producing a range of ribbon mics, it was a natural progression for AEA to develop a bespoke preamplifier to help extract the best possible performance. AEA's 'The Ribbon Pre' (TRP) is the result. This is a no-frills, dual-channel preamp, and its first obvious difference over most generic mic preamps is that it is able to provide an astonishing 83dB of gain. A coarse gain stage provides 6-63dB of gain in 12 steps, and a variable output level control allows a further 20dB of gain to be added, as well as enabling the signal to be faded out completely. The only other channel controls are push buttons to invert the polarity and to insert a high-pass filter (12dB/octave from 100Hz). A simple three-LED level meter is provided. The green LED lights at -5dBu, while the yellow increases in brightness from 0dBu up to +20dBu, at which point the red LED illuminates. The balanced outputs clip above +28dBu, which is higher than almost all recorders or consoles. The rear panel carries four XLRs for the two mic inputs and two balanced line outputs. There is also a quarter-inch socket for each channel, providing an unbalanced output roughly 6dB lower in level than the balanced output. Power is provided by an external PSU which connects via a 7-pin DIN plug. 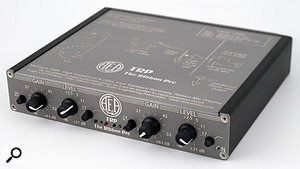 Physically, the TRP is 1U high and half-rack width, with a block diagram printed on the top panel and laser-engraved control and connector legends. Most dynamic mics prefer working into high impedances, to avoid loading the moving coil or ribbon motor, and ribbons are particularly critical in this regard. Having designed a range of ribbon mics, AEA designed the dedicated Ribbon Preamp, which provides an enormously high input impedance.The preamp circuitry employs a discrete front end stage with JFET op-amps at the back end — all DC coupled to ensure a very fast transient response and quick recovery from input overload. The specs boast a very wide bandwidth of 6Hz to 300kHz (-3dB points), and an effective input noise of a remarkable -130dBu (150Ω source, A-weighted). Most dynamic mics prefer working into high impedances to avoid loading the moving coil or ribbon motor. Ribbons are particularly critical in this regard and the AEA TRP provides an enormously high input impedance. Depending on which set of published specifications you believe, it is either 18kΩ or 30kΩ. Both are extremely high in comparison to most modern preamps, which are about 2kΩ. There is (as you would expect) no phantom power, and the input actually includes protection circuitry, which shuts the preamp down if phantom power is detected on the input cable (which could happen if working with mic splits, for example). The avoidance of phantom power means that the traditional DC-blocking capacitors can be omitted, with sonic benefits. The manual is clear and informative, and contains some very interesting background information on ribbon mics in general, appropriate preamp designs and the dangers of phantom power. In use, the TRP is simplicity itself to set up and operate, but the quality of the signal path is very obvious. It sounds absolutely transparent and clean, even when operating at high gains. The high-pass filter is well judged for helping to control proximity effect, and the metering, although very simple, is sufficient to optimise gains reasonably well. In most cases, the recorder or mixer will have more detailed metering anyway, so it is pointless to have anything more elaborate on the preamp. All you need to know is that the signal is a healthy way from the noise floor, and well below clipping. The three LED meters do that well. Obviously, the TRP can't be used with capacitor mics, but it can be used with any moving-coil mic or, indeed, any valve mic with its own PSU (as opposed to the few phantom-powered valve mics that are available). Again, the quality of the preamp circuitry shines through when used with valve mics, even if the huge amount of gain is unlikely to be required! The AEA TRP is an impressive preamp whichever way you look at it, and given its bespoke nature and sonic quality it's not overly expensive either. Like all natural ribbon mics, the R92 has a bi-directional polar response — the classic figure-of-eight pattern — but, as I mentioned earlier, the design has been tailored to provide slightly different frequency responses for front and rear pickup. The front is described as 'crisp,' while the rear is 'smooth,' and these characteristics are easy to discern if you rotate the mic in front of a suitable source. Several modern ribbon mics now include this facility and it is surprisingly useful, allowing the user to choose which side best suits the requirements of each situation, and to tailor the sound at source. In generalised terms, I found the smooth side benefited most electric guitar amps and gave the familiar warm ribbon sound, while the bright side generally worked better on most vocalists, capturing a bright, detailed sound — similar to capacitor mics but without their typical edginess. Turning to the 'smooth' side helped with sibilant vocalists, or those with loud fricatives, reducing the annoyance factor significantly without seeming to throw anything crucial away. One of the most useful properties of any mic is the null (or nulls) in its polar pattern. So often in miking, the art is not so much about what you point the mic at, but where you aim its response null(s) to reject spill and ambience. The figure-of-eight mic — especially the ribbon mic — is probably the most flexible and precise in this respect, and the R92 certainly doesn't disappoint. The null is very precise and extremely deep, allowing excellent separation to be achieved in well-damped acoustics. I mentioned earlier that the proximity effect of the R92 has been balanced to allow placement about six inches from the source, and that is easy to prove just by rigging the mic in front of a source. Moving it an inch or two closer results in a more proximity boost, of course, and a correspondingly warmer tone as a result. Conversely, backing the mic off a few inches allows the proximity effect to fall, giving a leaner sound that might suit bass-heavy sources better. These significant tonal changes can be made with little effect on the amount of ambience pickup, because the mic always remains in the near field of the instrument anyway — which is really useful — and small physical differences in distance really do make a big difference in sound character. This is not a mic to plonk on a stand, point roughly the right way, and walk back into the control room to 'sort out the sound.' Getting the right sound at source is the key to this microphone and it requires some experimentation and critical placement in the studio. I found listening to its output on headphones while experimenting with placement extremely beneficial. Relative to some of the new Chinese offerings, the R92 is expensive, but the quality certainly shows through, and in comparison to many established ribbon mics it's something of a sonic bargain. It boasts excellent flexibility in its tonal range, it is easy to use and place, and it can be used a lot closer to the source than most ribbons would tolerate, which makes it well suited to home studio applications and modern miking techniques. If you are considering investing in the smooth, natural character of a ribbon mic, this is certainly one worth auditioning first hand. I've fallen in love with it! A number of ribbon mics have come onto the market in recent years. At the lower end of the price range are the SE Electronics R1 and Sontronics Sigma. More comparable in price range, and in terms of the 'dark and bright' characteristic, is Crowley and Tripp's Naked Eye. If you are considering purchasing the R92, it might also be worth looking at the Coles 4038 and 4040, and Royer's R121. 'Bright' and 'dark' pickup lobes add flexibility. Cost-effective for a high-end ribbon. Captive output cable makes storage messy. A high quality, high-gain preamp is required. An interesting development of AEA's larger ribbon mics, bringing very useful flexibility in terms of placement and a versatile sound character that neatly bridges the smoothness of classic ribbons and the bright detail of capacitor mics.